CapeClarke hosted a Newly Qualified Solicitor Careers talk in Manchester on 13 February 2019. The talk focused on the current NQ market in Manchester and the wider North West. We also provided all of the information trainee solicitors need in order to prepare for qualifying as a solicitor, together with detailed CV drafting advice. Additionally, attendees benefited from the wisdom of two guest speakers – David Easedown of Knights Plc and Tom Ward of FieldFisher. 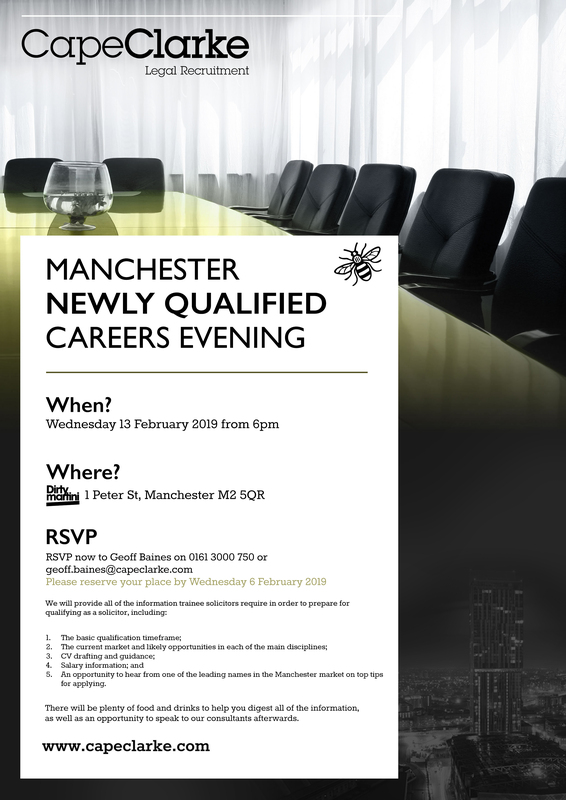 They provided an overview of what they look for in their NQ and junior solicitors during the interview process and other top tips for navigating the qualification process. We would like to thank the MTSG for their assistance in organising. If you are due to qualify this year in either Manchester or Leeds, please do not hesitate to get in touch as NQ roles will be released anytime from now. If you have been thinking about a move or would just like some general advice about options in the market, please feel free to contact one of our dedicated consultants on 0113 2385965 or 0161 3000750. CapeClarke is a leading niche legal recruitment consultancy operating across Leeds, Manchester, Sheffield, Newcastle, Liverpool and London. Please feel free to check out our priority legal vacancies by clicking here. Please note these legal vacancies are only a small selection of those we have been instructed on, so please get in touch if you do not see a role which looks suitable.